Have you ever walked around the produce section of your local store and located the display of recipe cards? The purpose of this is to make their customers purchase more, and it works well if customers pick them up and buy the ingredients used to complete the recipes. Well, last fall I was at Meijers and noticed a few recipes and I thought this recipe might be pretty tasty. I bought the Gruyere cheese, Gruyère, Switzerland is where it originated. It’s a nutty, pale yellow, firm cheese made from cow’s milk. Kenny grows tons of Swiss chard and I am always looking for something new to experiment with, this recipe turned out to be a winner. Kenny loved it and it makes a great light summer evening meal, served with a lettuce and fresh sliced tomato salad and crusty garlic bread. YUM! Saute onions 5 minutes or until soft and translucent, add Swiss chard; cook and stir until wilted. Add garlic; cook and stir 2 minutes. Cool slightly. In a large bowl whisk eggs and half and half, season with salt and pepper. 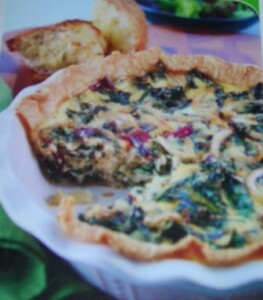 Spoon Swiss chard mixture into pie crust. sprinkle with Gruyere, pour egg mixture over top and sprinkle with Parmesan. Place on basking sheet, and place into pre-heated oven. Bake 45 minutes or until set in the middle, remove from oven and let set 10 minutes before serving.